This is the summer of Josh Brolin. First, we saw him take on the role as Thanos in The Avengers: Infinity War, now as Matt Graver in SICARIO: Day of the Soldado. When asked to create a recipe for this movie, we immediately went to a cocktail. Why? Well, the answer is simple, who doesn’t love a cocktail and an action movie? 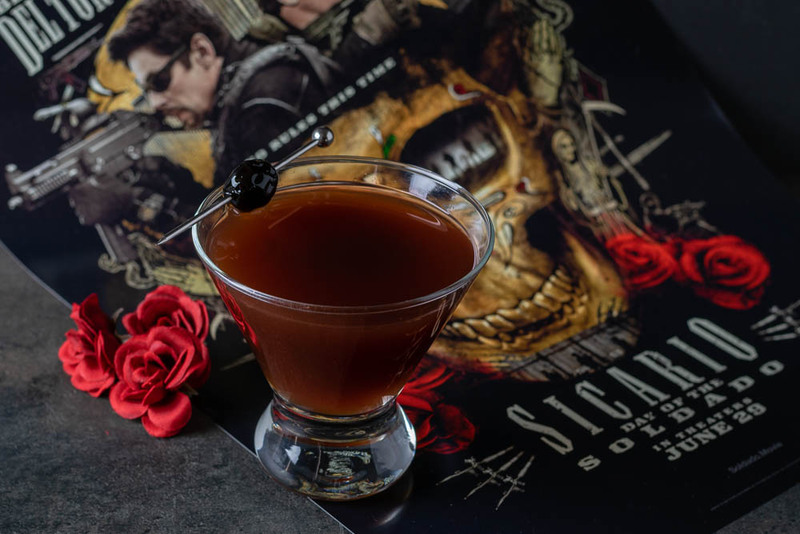 The idea for The Soldado came primarily from the fact that we really wanted to create a cocktail recipe that used tequila. However, instead of creating a take on a Paloma or Margarita we decided to add a bit of rum. We also added sweet vermouth and a few other ingredients including AZ Bitters Lab Mi Casa Bitters to round it out. We hope you enjoy The Soldado! Want to see SICARIO: Day of the Soldado? Well, you’re in luck! We are giving away 5 pairs of screening tickets for a sneak preview! The screening will be held at Tempe Marketplace on Tuesday, June 26th. The screening starts at 7 pm and the winners should arrive at 6:15 in order to guarantee their seating. Winners will be selected on Sunday, June 24th. Good luck! Stir all ingredients in a cocktail mixing glass over ice.